MASTERPIECE has been one of the most widely used sires in the breed over the past few years. His consistently spectacular producing daughters are valuable assets for anyone who owns them. They are easy-fleshing, great-milking and powerful producing females with outstanding udder structure. 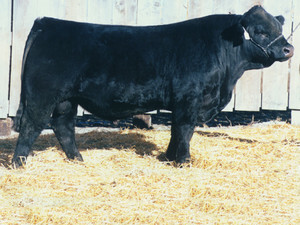 He ranks as the #3 bull of the breed for milk EPD and has 4 sons or grandsons in the top 12. His sons are just as great as his daughters with lots of thickness down their top and quarter and plenty of capacity and fleshing ability. MASTERPIECE’s mother is the great Gold Dam, BEV EMMA 262E who is also the mother of our very maternal herdsire, BEV GARRETT 26G. He is also a breed trait leader for scrotal circumference, fat thickness and retail yield %.